After running the Austin turkey trot for six or seven years, we decided to forego the big downtown crowd and go to Georgetown instead. 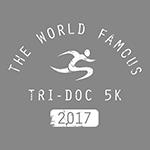 It starts earlier, gives out long-sleeved tech shirts, oh and my coach is the race director. It was a beautiful day for a race–50* and sunny at the start. Unlike the Austin race, in Georgetown parking was plentiful and free. We parked in a lot two blocks from the square–easy peasy. Public restrooms were available a few blocks the other side of the square–they were very small and running out of supplies, but there were only four people in line in front of me, so there’s that. As we walked back from the restroom, the kids’ race was ready to start. So to get out of the way we wandered over to the registration table where one of our BRFs was volunteering. There are two types of runners: people who collect their race stuff three minutes before the start of said race, and normal people. We’d brought the dog as incentive for the teenager to gripe slightly less about ruining his favorite holiday running a race. But he’s a weirdo on the leash (the dog, not the kid) and he acted like he had to vanquish every dog in sight to protect the realm. I am tapering for CIM, so my mileage has been lower and less intense this week. And with the good weather, I kind of wanted to race this one. I haven’t had a strong 5-miler in a couple of years, and the stars seemed aligned for something good today. Although the race was untimed, I had my Garmin and I knew what I needed to run to beat my best 8K time. The beginning was super crowded and I could hardly move at all, trapped behind walkers and strollers, and I zigzagged a lot. Thankfully after the first turn it thinned out a bit and I settled down. We ran on flat streets for about a quarter-mile, and then two big downhills meant my first mile was too fast. From there the course threw in just enough uphill sections to keep me in check. The kid and the dog slingshotted with me for a while, but after two miles of that combined with zero training, they couldn’t keep up. I also saw a few of my Rogue friends—usually as they passed me. We ran through San Gabriel Park, then looped around and crossed a bridge; from there, we ran mostly on residential streets. At the top of one of the longer hills, I couldn’t get my breathing back under control so I slowed briefly to use my inhaler. It was enough to make Mile 4 my slowest. Still, I was feeling good. Monday night’s core class and Tuesday’s 10K hill workout trashed my quads, and on Wednesday I was pretty sore. It seemed like a rest day did the trick. The hills were far less difficult than the ones I ran on Tuesday, so I maintained a quick pace. I don’t know Georgetown very well, and since I’d never run this race before, I didn’t have a clue where I was most of the time. Then I rounded the last turn and recognized the road we’d started on. A block later, the bathrooms we’d visited earlier. Some cheering friends. Then the finish. I sprinted to pass the woman ahead of me—I think I got her at the very end—which did exactly nothing except make me feel better for beating someone wearing a turkey hat. The course wasn’t quite five miles—Coach Bill says he knows it’s short but adding .10 would screw up finishing in the square. Since it’s untimed, eh, 4.9 will do. According to Garmin, I unofficially ran 4.89 miles about 50 seconds faster than my official 8K PR. So like elections in Florida, it’s too close to call. Considering that PR is from 2015, I’m going to declare it a win either way. Another win? I finished well ahead of the teenager. Haven’t done that in a while either. 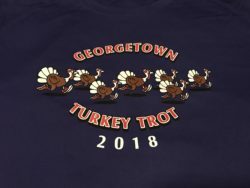 The Georgetown Turkey Trot is well-organized, parking hits the trifecta of easy/close/free, the course is challenging but not too difficult, and registrants get a long-sleeved tech shirt. We were finished and heading home before the Austin race even started. What’s not to love? To paraphrase Arthur Carlson: As god is my witness, I thought turkeys could fly I will never get stuck in a post-race downtown parking garage again.